My name is Steven (call me Steve.!) ..born 1963 London. From childhood ...have always been interested in/loved cars. My first car ..being a Reliant Regal Supervan 700, followed very swiftly by a Reliant Robin 850 (3-wheeler..using my motorcycle licence.! )...Having my share of british cars ..amongst them ..Ford Cortina mk.4,Vauxhall Viva mk.2,Rover 820,Rover Metro 1.4 gti-16v twin-cam ...etc.. I was a member of the American Auto club UK (1989 to 2001)& have owned ..Chevrolet Monte-carlo (305ci)...Cadillac Seville(350ci)..Buick Electra park avenue(350ci)..Oldsmobile cutlass 442...Buick Regal coupe (305ci) ...+ others.! Due to the vandalisation of my last american car (the Regal coupe)and the cost of repair.! ..I gave up having a decent car ..& opted for Cheap bangers.!! (..at least if it's damaged,it's no big worry/loss.!) ..I currently drive a 1995 Rover 218 SL TDi. ..Also having a few(hundred..!!) 1/43 scale.! (Recent estimates (November 2009) around 40,000 cars in my collection .. & hopefully ...soon will have a website to show some of them)..my motto "...if I can't have the 'real thing' ..at least I can have a model of it.!" I have contributed to Doug Breithaupts "Tales of Toy cars" website/webzine & have an acknowledgement for my contribution to Bill Manske's "Corgi Juniors & Husky" toy car book. (1984)I wanted something bigger & faster, so traded in for a Moto Guzzi 850 T4 with Le Mans conversion. After some time the Viva was passed to my brother & I bought a Ford Cortina Mk.IV, another reliable & loved car. I'd always loved American car's & had posters up in my room. I especially recall a Plymouth Roadrunner 440 six-pack! Unable to afford one of these, I settled for a Chevy Nova (Canadian built) & said to have had some handling/performance package (not that I ever had time to test it out!) The engine packed in after a couple of months.! The Electra was very luxurious & comfortable (an ex-Sheiks car! ), but was Not the easiest car to drive around London (being only a inch shorter than a Daimler Limousine.!) ...my thinking, I want something smaller & sportier, I went to have a look at a Firebird Trans-Am (with cracked windscreen) but turned it down. The 6000 STE had a 'knightrider'-ish digital dashboard which after a year or so, decided it wasn't going to work anymore (I got qoutes of £600 to get it fixed) The car was still driving ok, but I had No speedo, No Fuel gauge or any other warning lights.!! 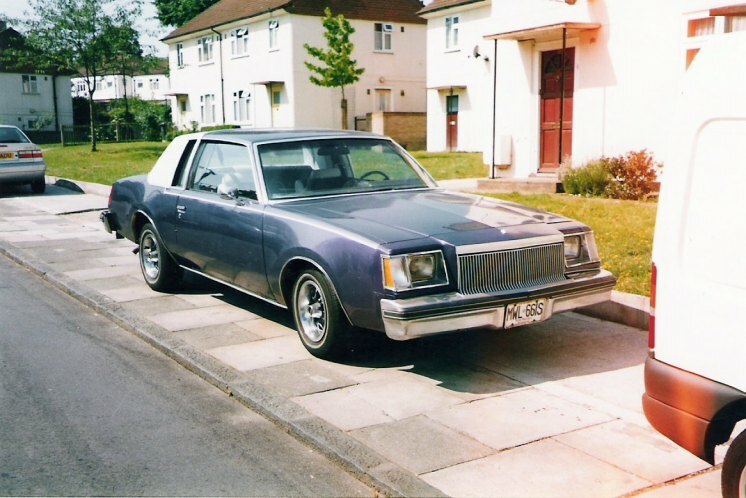 ...I carried on driving it for a while longer, but eventually traded it in for another Cutlass (a 6 cylinder Sedan) which I used for my wedding. So I now had two Cutlass', one six cylinder sedan which I didn't really want & a V8 Cutlass Brougham which wasn't going anywhere (too much work needed doing on it). I went to my regular dealer, who took both of them off my hands. When I started working again, my regular American car dealer had closed down (retired) & there were no other dealers close by, so I opted for something 'cheap & reliable' a VW polo classic (sadly no photo's of it, although it lived up to expectations, good car), followed by Austin Maestro (broke down immediatley! 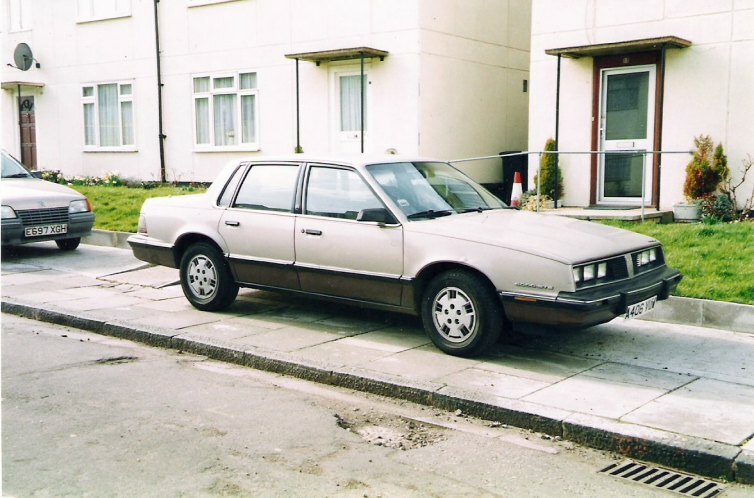 ), a Rover 820 (..gearbox troubles again! ), Rover metro GTi (camshafts went) No photo's taken of any of these three cars.